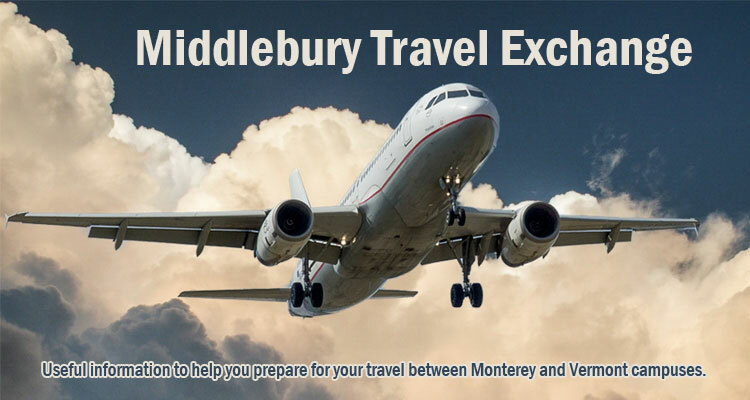 The “Middlebury Travel Exchange” is a newly created resource to offer useful information that will help staff and faculty prepare for travel between Monterey and Middlebury. It’s especially for people who have never traveled between the College and Institute before, but may be helpful for seasoned travelers as well. This informal resource comes out of a recommendation from the Institute campus’s Organizational Transparency and Information Sharing (OTIS) task force. Please see the link for “Travel, Entertainment, and Expense Policy and Procedures” on this Middlebury Policy Page for official guidelines from the Controller’s Office – Accounts Payable Department for reimbursement of travel, entertainment, and business expenses. Questions about how to navigate this resource? Got something useful to add? Feel free to contact Evelyn Helminen with general suggestions to make this guide better. This entry was posted in Midd Blogosphere and tagged Institutional News, Midd/MIIS Collaboration on February 28, 2018 by Evelyn Helminen. Have you been “meaning to write more”? Drop in and write Monday-Friday with other writers on campus. This open drop-in writing group has been created so that you can have a regularly-scheduled time to write during the week. It’s also an opportunity to meet with like-minded people at MIIS (faculty, staff, and students) who also want to write. It’s open to everyone in the MIIS community. No writing critiques or sharing your writing, unless you want to. We just get together and write. Meetings are daily, Monday-Friday from 11:00-12:00, and are held in the McGowan 210 Suite, MG 210-C (unless otherwise specified). The structure is very simple: Show up, say hi, set a timer and write silently for 25 minutes. Take a short break, chat about your writing project if you want, do one more writing “sprint” of about 25 minutes. Leave. No writing critiques or sharing your writing, unless you want to. We just get together and write. You can give whatever type of commitment to this that works in your schedule this semester. If you can only come once during the semester, that’s fine. If you want to come daily, that’s fine, too. If you can come, but need to arrive late or leave early, no problem. Just be respectful of the other writers and try to come and go quietly if it’s in the middle of a writing session. Please email Evelyn Helminen if you want to be added to the Outlook calendar invite for this writing group, which will also alert you if there are changes for a particular meeting. If you would like to be reminded, email Evelyn and let her know which day(s) of the week you would like to come, ehelminen [at] middlebury [dot] edu. This entry was posted in Midd Blogosphere and tagged MIIS News & Events on January 30, 2018 by Evelyn Helminen. This writing group is open to everyone in the MIIS community. The purpose is simply to offer a time and space to write twice a week. This allows you to put it in your calendar so you can make regular progress on your writing goals, especially if you “have been meaning to write more.” It’s also an opportunity to meet with other writers at MIIS—faculty, staff, and students. No writing critiques or sharing your writing, unless you want to. We just get together and write. You can work on whatever type of writing you want—a book, a paper, a report, a journal article, creative writing, poetry, etc. Meetings are Wednesdays and Thursdays from 11:00-12:00, and are held in the DLC’s McGowan 210 Suite, in the DLC Pacific Room (unless otherwise specified). This entry was posted in Midd Blogosphere and tagged MIIS News & Events on August 29, 2017 by Evelyn Helminen.